Paul: It’s interesting that you considered non-fiction for a time. Do you think that had more to do with the encouragement or with the passion for that particular subject matter? I mean, it sounds like honest feedback and encouraging support has been important for your motivation levels, but maybe the interest in dog training was part of what made the manual noteworthy to the teacher. Do you still train dogs? Anma: While I still love dogs and could never be without at least two, I eventually realized that training wasn’t a true passion and that it wasn’t one I wanted to “ruin” by making it a job. These days the only dogs I train are my own girls, but mostly just basic manners and general obedience. Paul: This concept of “ruining” passions by monetizing them (i.e. becoming successful in the capitalistic sense) is one I’ve thought about a lot. Do you ever worry about losing the appeal of writing if you were to become a successful author? Or is writing a different kind of passion for you? Anma: I do worry about that, quite a bit actually. Usually, I find that when I something I love becomes a “job” or a “chore” I start losing interest in it. I am hoping, though, with writing it is a different kind of passion, much like my “real” career which is web development. It was something I loved before it became a career and well over a decade later, I still love it though I do it 40 hours a week. With the writing, I do find myself struggling with the more “professional” side, i.e. the editing, researching information, the cost of editors, etc. But so far, it hasn’t deterred me from the actual joy of writing. Even when I’ve had to really struggle to finish a piece and was saying all sorts of profane words, I was able to keep myself going. I do think it’s one reason I’m leaning towards self-publishing my novels, though. With traditional publishing, it feels like it will be more rigid and too confining, which would really kill my pleasure in it. Self-publishing will give me the greater flexibility to work on my own schedule and in a way that lets me keep my inner author happy. Paul: So do you think you would prefer to transition away from your web development day job if given the opportunity to write full-time for a living, or does writing seem like it will always be kind of a passion project for you? How many hours are you devoting to writing right now? Anma: No, web development will be my career until I’m too outdated or old to code. I am a geek at heart. [laughs] I think writing will always be a passion project for me, one that I do “on the side” but not one that would be a full-time career. I’m practical enough to realize that even if I wanted it to be my main job, it isn’t a career that pays the bills in general, except for the rarer mega hit authors. For hours to writing…it depends. I’m an odd duck with my writing—I don’t hold to the adage of “write every day,” at least not in terms of my novel writing. I still do all of my primary novel drafts during NaNo, so in November, anywhere from 3-6 hours a day. The rest of the year I devote to editing—though I’ve been a bit half-hearted in those efforts until more recently. I now work on a schedule of at least one day a week where I spend 3-5 hours working on the revisions for my current project. It breaks with the “norm”, but it helps me avoid that burn out sensation. Paul: Is burn out a big concern for you? What kinds of things do you find help keep charge in your creative batteries, or put it there in the first place? What part of writing is the most rewarding for you? Anma: I do worry about it sometimes, mostly because I have so many balls in the air and different creative pursuits that it can be really draining at times. When we’re getting close to a launch in my web work, I’m usually so drained I’m doing well if I can string together coherent sentences in emails. For recharging, usually rest is the first option—a day away from my LCD screens to just relax, read, bike ride, etc. We also do a vacation at least once a year when I try to unplug as much as possible, which really helps give me a big reboost overall. For getting the charge… I think it’s really just getting into the story. Once one really grabs a hold of me, if I get into “the zone” so to speak, I can work on it for hours without realizing it. I’d love to say writing is it’s own reward, but it sounds so clichéd and not very accurate. [laughs] Part of it is getting the story written and then reading it myself (after at least a month away from it). If I start reading my own story and stay up half the night finishing it, I’m already pretty happy. The best reward, though, comes from someone else reading it and liking it. I hate to admit to needing that external validation, since I’m generally a fiercely independent person, but it so helps. It’s like with my blogging—I enjoy blogging, but when I started getting comments from people who were reading it, then I got a burst of energy and was so excited. When the podcast hit 20 listens on the first episode, I ran around the house like a little kid. So yeah, I guess even I need a bit of acknowledgement that someone else out there is reading/listening. Paul: I think that’s a very natural thing. I read once (can’t find the reference now, of course) that there are writers who write because they just have so much to say and those who write because they feel very uncomfortable expressing themselves any other way. For example, the first group might be people who will talk your ear off, talk to themselves, and still find they have words with nowhere to go, so they write. The other group is much more introverted, but they store up all these ideas and stories they want to tell, and the outlet they feel comfortable with is written, perhaps because it’s sort of indirect. But in both cases, they’re really looking for that moment of connection where they can express something and get a reaction from another person. I know the adage is to write for yourself, but that’s kind of misleading, right? Ultimately, writing is about expression and communication and for that, you need other people. Anma: So very true! It’s hard to be a story teller if you have no one to tell the stories to! Paul: You mentioned before that your sweetie has really encouraged you in your writing. Do you find yourself writing with that person in mind, or do you have a different kind of ideal reader? Anma: Yes and no. Demographically, not at all. [laughs] I was really surprised that he liked the first of my novels he read, which was Aisuru, my Young Adult supernatural romance. Not something you picture a guy in his 40s liking, but he often surprises me in good ways like that. In general, though, I guess he would be my ideal reader, namely someone who simply enjoys reading my stories. I know that’s so generic, but I don’t really have anything else in mind, I guess. The only kind of reader I wouldn’t consider ideal would probably be someone one who hates my writing but won’t articulate why. Even with my sweetie, he isn’t fond of my story The Strength and the Light, but he could tell me why so I was fine with that. I’m big on the why… too many times in my life when someone did or said something negative but would never say why they did it so I was left wondering. Unanswered whys bug me. Paul: I’m the same way. Even with positive reviews I tend to feel feedback isn’t all that useful unless someone can explain what about it worked or didn’t work for them. Do you tend to work in Young Adult or was Aisuru sort of the exception? What about YA do you find interesting or appealing? Are there any aspects of writing for a younger audience that you find more difficult than more mainstream fiction? Anma: I’d guess Aisuru was an exception, of sorts. I never write with a target age group in mind, and when I wrote it, I never consciously intended it to be Young Adult. It’s considered that primarily because of the main characters’ ages versus any actual effort on my end. One of my other novels is likely going to be considered YA as the characters are pre-teen through teen for most of it, but like with Aisuru I don’t make any conscious decision to target that age group. I guess it will be interesting to see if they end up appealing more to “not quite young” adults, like me, who also enjoy YA or to actual young adults; since I don’t target YA specifically, I write them as I would any other novel. At the same time, since the characters are themselves primarily teenagers, their POVs reflect their age, life experience, etc. In that regard, I do sometimes find it harder to write from that POV since I haven’t been a teenager in, um, awhile, so I have no idea about trends and what not. If I find myself worrying about that, though, I remind myself that the characters are their own individuals so what’s “cool” is less relevant than telling the characters’ stories in a way that is true to them. Paul: I imagine that’s a big concern with a lot of “adult” adults when writing YA. I get the sense that youth culture is sort of this impenetrable, constantly shifting blob of concentrated zeitgeist that is comprehensible only to the people who are currently experiencing it. And yet, as with all fiction, there are certain universal human truths you can tap into that make it feel authentic even without actually entering that specific bubble, you know? Anma: Yep, that is one thing I hope I am doing well with each of my stories. Regardless of how “different” the characters are, I want them to be compelling persons readers can relate to. Paul: Do you read a lot of YA? Do you consider it research or would you read those kinds of books even if you never wrote anything featuring teenaged protagonists? Anma: An interesting question. I do not read a lot of YA in terms of the more modern stuff. I browse the YA shelves at Half Price regularly, but I rarely find anything that I want to get. Unfortunately, it seems like the trend these days is for most YA to be written in first person POV, which I’m not a fan of, so books written in that POV have to “work” a lot harder to get me to give them a chance. There have been some, however. One that I had on my wishlist was Forbidden, by Tabitha Suzuma, but I got spoiled to the ending before I could pick it up which ruined the entire story for me before I even read it (a throw the book across the room ending, for me at least). I also really, really, really, really hate present tense writing, which sent me running from otherwise intriguing stories, like The Hunger Games. While I will take chances on first person POV, the present tense thing just sends my mind into full reject mode. It literally hurts trying to read it. I do enjoy older YA works, though, such as the books by Lynn Hall as well as some classics like Island of the Blue Dolphins and Little Women. I also read several light novel series from Japan that would fall into the YA category. I also admit, I read a ridiculous amount of manga, predominantly shojo and shonen works, which would be the equivalent of YA in terms of character ages for US novels. Paul: You know, I only just read Island of the Blue Dolphins for the first time a year ago and I was amazed at how well that book reads even to someone who is far outside what I think is the target audience. I’m intrigued by your rejection of certain writing styles such as present tense and first person. I’m sure a lot of authors, including established ones, have these same kinds of prejudices but it still stands out to me. I tend to think of all of it as just more tools, interesting aspects of storytelling that can be used to convey a story in the most effective way. Do you know what might have given you such a visceral reaction to things like present tense? Was there a book written that way you read at some point that turned you off to it? Anma: For present tense, I think it is really just that mind can’t process it well; it doesn’t read well for me and just feels wrong. I’ve tried pushing past it at to give a story a fair chance, but it usually gives me a headache. So for present tense, it isn’t anything particular with the stories themselves, it’s just I truly cannot read that style of writing style at all. Paul: Okay, last question, and this is going to be a thing I ask everyone: Tell me about the best book you’ve read recently. Anma: Oh wow, ending with the hardest one! [laughs] Seriously for me that is a super hard one as I have a hard time labeling any book “best” because I love so many, and it’s extra hard as I haven’t actually read much lately. Hmmm… I guess I’d have to say Pride of Baghdad, a graphic novel by Brian K. Vaughan and illustrated by Niko Henrichon. I stumbled on it years ago at Half Price and re-read it recently as I recommended it to listeners on my podcast. Loosely based on a true story, it is an incredibly moving story about four lions who escape from a Baghdad Zoo during the Iraq War. Each of the lions is a different embodiment of the ways people responded to the war, while also providing an appropriately brutal look at the harshness of war in general. It makes me cry so much every time as I read through the struggles and tragedies that their first taste of freedom brings. It isn’t an easy story to read, but it is one I strongly recommend. 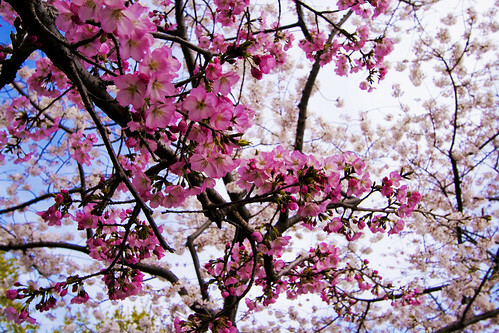 Anma Natsu is a 30-something web developer and spinner of love stories in east Texas. She has been writing since middle school, scribbling bits and pieces of stories over the years before completing her first full length novel in 2009. 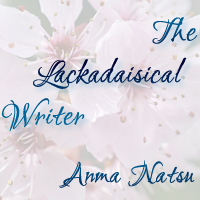 Anma started hosting her own podcast, “The Lackadaisical Writer” in July 2013, available on iTunes and Spreaker. Away from her writing, she is a mild Japanophile, loves watching natural disaster and monster animal B-movies, and playing video games. Anma shares her life with her beloved sweetie, two devoted dogs, and one very vocal cat. Her first novel, Aisuru, will be released in 2014. Find her online at http://anmanatsu.com or on Facebook at https://www.facebook.com/AnmaNatsu. Wow! Great interview! I’m impressed with both the questions and the answers. And I love how in depth Anma goes when describing her writing processes, fears and trying to maintain a real life while writing.